This quote from Steve Blank (which I realize is taken out of context, but such is the nature of Twitter, I’m not sure where he was speaking today) definitely rubs the marketer in me the wrong way. 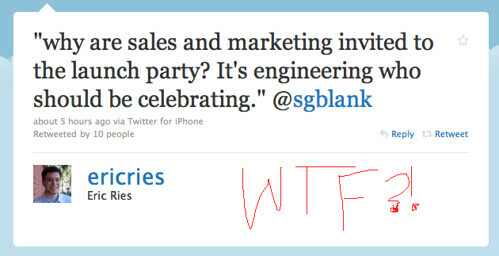 Why would you ever want to exclude marketing and sales folks at your startup from the launch party (or any of your employees for that matter), as if they had no part in it? My first reaction was to feel at bit nauseous about all the startup founders and employees who are influenced by Eric Ries and his popular Lean Startup methodology for product and market development, and probably read this tweet. I feel like supporting this attitude encourages one of the most painful, costly, and damaging mistakes that was made at my last startup — and after thinking about it for a couple hours, I can’t not say something. This isn’t ultimately about Steve’s quote, or Eric’s support of it, which I see as symptoms of the problem. It’s something I’ve wanted to write about for a long time because I experienced it firsthand in my previous startup and it was very damaging to the product, culture, and IMO ultimately the company. This mentality of “developers before everyone else” is poisonous in startups, and it’s on the road to dangerous levels of hubris, and “pivoting”, or changing the direction of the business multiple times, due to a disconnected view of the world fueled by a Field of Dreams mentality (“if we build it they will come”). To make great early marketing and sales hires it had better be “our startup” together, in spirit not just in equity stake. When a startup is founded, ideally the entire team is technical. There is probably someone who is the most business-minded, but not a dedicated sales or marketing person. If there is a non-technical member of the founding team, they’re probably (hopefully!) very deeply engaged in the product development aspect of the startup, and have earned the trust and respect of the engineer(s) co-founders. Depending on the product and other market conditions, it is possible that the founding team of engineers will launch without anyone in sales or marketing at all, and their developer design and active use of social media will help them spread the word. This is exactly what happened with Twilio, which was launched in November 2008 without anyone whose entire job was to take the product to market. If the product offering is compelling enough, or the cofounders are particularly interesting to the community, getting a TechCrunch story will require little more than a thoughtful email to the writers and a slide deck on Slideshare. This is the best case scenario, and in my opinion indicates a very well-rounded founding team with strong awareness of their market (business savvy) — even if their primary focus is building technology. However, after that initial burst of attention and activity there are many questions to be answered that have a more to do with building a business than building a product — like how to continue to gain and retain customers. This is where sales and marketing are helpful to have before launch, to make plans for achieving these goals. The launch of a new product is just the beginning of what will hopefully be a lasting and happy relationship with customers, press, analysts, and the marketplace in general. It is a moment of inflection and incredible stress for the entire organization, whether it is three people, thirty people, or three thousand plus. It is gloriously terrifying, and its something teams bond over. There is no question that the vision and actual act of creating of the product is what makes it all possible, and that the people who build things that have never existed before are some of the most amazing human beings on Earth. The greatest insult to a great product, and the people who created it, is to market it poorly. This is the core of how I approach marketing. Every day that I am spreading the word about Twilio, getting more people to signup, use, and pay for our product I’m honoring the ingenuity that created it, as well as the combination of intellect and execution that continues to make it better. 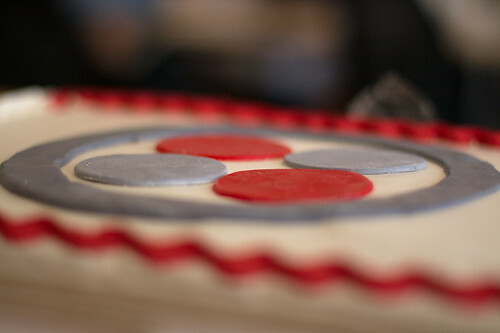 When I interviewed I remember the exact moment I was sitting with Evan Cooke, CTO and one of three cofounders, and he offered me the opportunity to work at Twilio as their first hire. I looked him in the eye and told him, “I can do this job, but we have to agree that marketing will never become a second class citizen to software development”. I was actually afraid, for a moment, that I wouldn’t get the job but I told my husband later that I’d rather know right then what kind of company it was going to be than be miserable for the next year figuring it out. That was 18 months ago, and I’ve never ever felt for a moment that there was a disconnect between the engineering team and the marketing team, which now includes a customer service manager and two developer evangelists, in addition to myself. One of the hardest lesson I’ve learned in business is that despite all my energy and intelligence, I can’t do everything by myself. Talented people making tough judgement calls aren’t fungible, and in general human beings don’t scale very well unless we can find other people to help us achieve complex and long range goals. The goal of a business is to organize a bunch of individuals to achieve a common goal, and properly celebrating achievements is a big part of keeping them organized. Fortunately, if we recruit well we can come to trust marketing and sales to focus on things that the technical co-founders can’t or shouldn’t have to deal with on a daily basis. This initial division of labor within the startup seems to be a painful transition for technical cofounders — especially those who have never managed other people before. It becomes even worse because the cofounders are managing people who are experts in something the cofounder might not understand very well like sales or marketing. For the executive, it is harder for them to validate skills and expectations or pass judgement firsthand when they don’t have operating experience with a particular kind of role. This is where building deep trust, and fostering an open culture where the sales or marketing person is responsible for sharing and educating about how they’re achieving their goals is important. It’s also a strong case for objective metrics everyone can agree on, such as adoption numbers or revenue goals. Flip this around for a moment. Do you think good, honest, hardworking non-technical employees are going to join your company if you tell them they’re there to “just market my startup” or “just do customer service for my startup” or “just sell my product”? To be good at any of those tasks, and especially to be the first person to say “I’ll follow you, take less salary, some equity that might not be worth anything, and work 24/7” you need to have ownership – it had better be our startup, in more than just an equity stake. You better mean it, because these people will be the human embodiment of your brand. I love this quote from Warren Buffett, “you attract what you are” and I find myself reflecting on it often. I haven’t fully tested this, but I’d be curious to hear if it holds true — does a culture where writing code is considered the most important productive activity in the company attract marketers and salespeople who think their job is the most important thing in the company? Do people with a disconnected view of reality attract other people with an equally disconnected perspective? My gut says yes, although I could use some more data. The corollary here is that if you are the kind of culture, or the kind of the founding technical team, that sees the launch of your first product as the groundwork for building a fully fledged successful business – you’ll attract early sales and marketing hires who want to be part of this long term vision. Here are some things I’d suggest you look for in your first marketing hire. Great Marketer or Great Generalist? To get back to the original comments that inspired this post, it’s not about the launch party, it’s about launching. 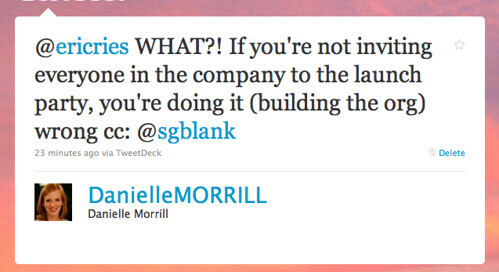 Your launch party is for show, usually to bring attention to your new product and group together all your well-wishers and potential customers so you can say, “ta da!” It’s a branding thing, and very different from that moment at 3am where you crack open a $4.99 bottle of sparkling wine you bought at Trader Joe’s and say to the team, “we’re live”. Or that moment at 2am where you find a member of your customer service pouring over every last detail of the freshly written FAQ. Or that moment at 11pm where you merge in your latest changes and your sales guy offers to run out and get pizza because the engineering team is starving but has hit on some nasty conflicts. These aren’t the most important tasks, but they make launch just a little easier and they keep us human and connected through the exhaustion and struggle to build great products and companies. 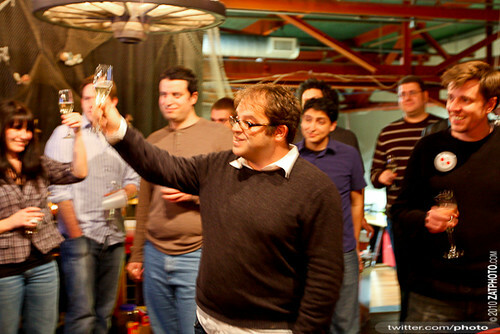 They do honor to the people and products that make startups possible. I didn’t start out my career as a marketer, and I’m sure I don’t have it all figured out, but I can tell you how I try to live by this at the startup I’m working on today. At Twilio we have a culture where everyone contributes to customer service and the majority of developers attend marketing outreach events, speak at conferences, create marketing materials like screencasts or how-to content for our website. When we hire people for non-engineering roles, we require them to write a basic application using our API. With regard to sales, we take pride in making money, and openly share our revenue numbers and balance sheet with the entire team at our weekly all hands, and celebrate big sales wins together. We’re hiring.